Or, how to depict a saucer. My very own "UFO" photo. Here is my very own "UFO" photo. IT IS A FAKE! I took it in March 1967. If proof that I took the picture is necessary, I can lead anyone to the site of photography. This is the first time the picture was ever published. Your mission, should you decide to accept it, is to identify this object, and how the photo was made. 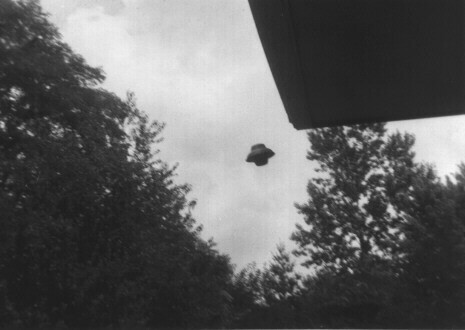 As always, if anyone is caught or killed while trying to pass this off as a genuine UFO photo, they will find themselves totally made into fools, because this page shows the truth of this photo. Any site or source using this photo in any other-than-truthful way will be listed as a deceitful source on this page. Your belief in extraterrestrials will self-destruct in 10 seconds. The first person who guesses the correct identity of this object and the method of photography used will win my coveted Eludo-Prize (which is a quantity of air, shipped without any container -- the winner will have to guess when it arrives). The person's name will be posted on this page. Derek Verner, found on the TASCAM BBS, figured this out on 06/30/2003. The object was made from two thin vacuformed plastic dishes (small and medium) in which sundaes were sold from an ice cream truck. The dishes were taped together and hung from the roof (visible in photo) with monofilament fishing line.